Realize a new hope for your journey together! What if my partner and I could rekindle the spark? You might enjoy “marriage magic”—courtesy of Dale’s latest book, in which she applies her expertise in business communication to the issues of home and family. Marriage Magic! Find It, Keep It, and Make It Last (co-authored with psychologist Karen Sherman) speaks directly to couples who stay together but lack a certain something in their relationship. With a refreshing, energetic style, Dale and Karen help you identify what’s missing, how you got to this point, and how your emotions contribute to the situation. By using the tools and exercises in each chapter, you can infuse your relationship with new life—and gain a renewed sense of hope for your journey together. 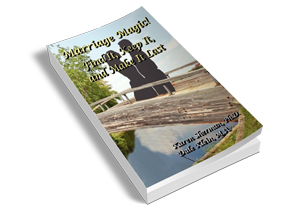 No matter what kind of committed relationship you’re in, this book can help you and your partner rediscover that “magic” that every relationship needs. Find out more or purchase Marriage Magic! Find It, Keep It, and Make It Last by clicking here. A self-help book written by a psychologist and communications expert that speaks to couples who have chosen to stay together but find that their relationship is stale and flat. Rather than just teaching good communication skills, these authors help readers identify what is missing in their relationship. It offers lots of exercises, is user-friendly, and is effective even if only one partner reads it.